Plyometric training, also known as “reactive training” or “jump training,” employs the explosive movements of jumping, bounding, and hopping to train the neuromuscular system for efficiency, build muscular power, and increase dynamic stabilization. If you’re an athlete or just a fit person in good physical condition looking to take your performance to the next level, plyometric exercise may help you achieve your goals. Read on to learn about plyometric training exercises, including the benefits of plyometric exercise, how plyometric training builds explosive power, information on who should and shouldn’t do plyometrics, how to safely and effectively build plyometric exercises into your workout routine, and six of the best plyometric exercises which can be sequenced into a plyometric workout. 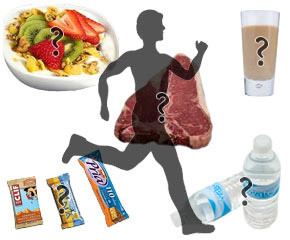 Jump Down to The Plyometric Training Exercise Videos or continue reading to learn more. Plyometric training optimizes your neuromuscular efficiency, muscular strength, and dynamic stabilization, all of which work together to increase your capacity for explosive force. The neuromuscular system is highly adaptable, only recruiting muscles at the speeds and according to timing to which it has been trained. Plyometrics trains your body to respond quickly and forcefully, allowing you to move with more speed and power without compromising your safety. That probably sounds great to athletes of all stripes, including basketball players, football players, martial artists, dancers, runners, bodybuilders, and more. Casual exercisers of all ages may be able to benefit from plyometric exercise too, learning how to respond more efficiently and quickly to the tasks of daily living, preventing injuries. The intensity of plyometric exercise also burns a ton of calories, so plyometrics are helpful to those with fat loss goals. How Does Plyometric Exercise Work to Build Explosive Power? Three distinct phases happening in rapid succession are what differentiate plyometric training exercises from other forms of training, and explain why plyometric training is so effective for developing explosive power. The three phases are the loading (eccentric) phase, the transition (amortization) phase, and the unloading (concentric) phase. Just like stretching a rubber band, in the loading phase, potential energy is generated by stretching the muscles eccentrically. Picture a basketball player crouching down in preparation for a dunk. Next comes the transition phase: the short stabilization period as the body transitions from loading forces to exploding into action. The basketball player is now pausing very briefly at the bottom of his crouch. If the transitional phase is too long, the potential energy dissipates and the ability to generate a powerful movement is lost. A short transitional phase, however, leads to explosive power in the next phase. The final phase of a plyometric exercise is the unloading phase. The stretched rubber band is released; the basketball player explodes upward and nails his dunk. Without the previous loading and transitional phases, the athlete would not have loaded and directed enough potential energy to unleash the same power. He would not have been physically able to jump as high or as fast. These three phases may also be referred to as the “stretch-shortening cycle”, because the muscles stretch briefly in the loading phase before shortening during the muscle contraction characterizing the unloading phase. With training, your neuromuscular system becomes more efficient at properly sequencing all three phases of plyometric exercise, and you will experience improvements in performance. If you think about it, a great many movements you do every day employ subtler versions of the physical concepts behind plyometrics, in that they employ the stretch-shortening cycle. Even just getting out of your chair involves a little rock-back before propelling yourself forward. Your gait while walking or running involves the stretch-shortening cycle as well to provide the force necessary for movement. Who Should and Shouldn’t Do Plyometric Training? If you are an athlete or experienced exerciser well-trained in the areas of core strength, joint stabilization, balance, and flexibility, you may find that plyometric training is your ticket to the next level of fitness. The intensity level and the unique adaptations plyometric training exercise imposes on your muscles can help you reach your goals at an accelerated rate. However, it is important to note that plyometric training is not intended for beginners. If you’re considering adding plyometric exercise to your workout routine, you need to possess a solid base of physical fitness. You will need to have developed your core stability and strength, joint stabilization, balance training, and flexibility. If you are a fitness beginner, you will derive more benefit from focusing on other types of training on the initial steps of your fitness journey. Otherwise, you could end up with injuries. Plyometric training is also not recommended for people with chronic diseases such as heart disease or functional limitations, except under the supervision of a doctor. What if you are an intermediate exerciser beyond the beginner phase but not yet 100% confident in your level of conditioning? The best thing you can do is consult a personal trainer who can perform an in-depth fitness assessment to determine whether plyometrics are right for you at this phase of your training and help you design a workout plan tailored to your goals. Do your plyometric training exercises on a surface that is firm but has a little give. Options include a grassy field, a track, a cushioned gym floor, etc. Don’t do plyometrics on surfaces like blacktop or sidewalk; it’s too hard on your joints. Wear proper footwear to help support your joints and distribute the shock of all the jumping, hopping, and bounding movements plyometric exercise entails. The National Academy of Sports Medicine recommends doing plyometric exercise only after warming up with some light cardio for 5-10 minutes and going through your flexibility routine of choice. Do plyometric exercises before resistance training so your muscles won’t be too fatigued to continue. Your fitness level and fitness goals determine how often you should do plyometric exercise. Perform your plyometric exercises at least twice per week as part of your workout routine. If you’re a beginner in the realm of plyometric exercise, start slow to discover how your body reacts to the new stress. As you become more trained in plyometrics, you will want to perform the movements as quickly and explosively as can be controlled. Consult a personal trainer if you find you need help! Let’s talk about a few good plyometric training exercises to get you started. You can perform these exercises on their own, or sequence them as a workout. You may be surprised to learn that jumping rope is a basic form of plyometric exercise! To maximize the plyometric aspect of jumping rope, remain on the balls of your feet both when jumping and landing. 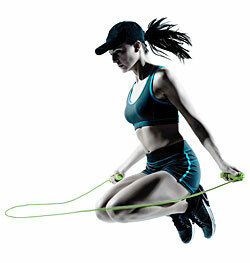 Jumping rope is also a wonderful cardiovascular exercise. Standing in a neutral position with feet pointing straight ahead, squat down as if to sit. Jump up while reaching your arms overhead. If you prefer, you can also place your arms behind your head or across your chest through the duration of the jump. Focus on a soft landing with the feet, ankles, knees and hips in alignment. Repeat 8-10 times, aiming for a regular, medium tempo. Perform at least one more set after resting for 30 seconds to one minute. This is a progression of the squat jump. Perform the motion of a squat jump, but tuck your knees up toward your chest when you jump up, aiming to get your thighs parallel to the ground. As with the squat jump and any plyometric exercise, focus on a soft landing with optimal joint alignment. A full-body plyometric exercise including a push-up, squat, and jump! Also great for cardiovascular conditioning. From standing, squat down, place your hands on the floor, and rapidly thrust your legs out behind you, landing in a plank position. Don’t let your core sag! Perform one pushup, then move through a squatting position right into a squat jump as described above. Pushups are an incredible bodyweight exercise for the upper body and core that pretty much everyone should be doing. They can also be made into a plyometric exercise for the upper body! Start your pushup as usual, but push your hands explosively off the ground when you come up, quickly clapping before placing your hands back on the ground and completing the dip-down portion of the pushup. Nail this one and you’ll feel like Rocky! Try for as many of these as you can do with optimal form. No article on plyometrics would be complete without the classic box jump. You may have wondered what those funky tall step-stool things hanging around the gym were; they are platforms used in plyometric training. To perform a box jump, simply choose a platform of the right size (start low until you get used to the exercise), and jump up onto the box and back down at a medium, repetitive tempo. Go for 8-10 reps, rest for 30 seconds to one minute, and repeat for at least one more set. Box jumps are tough. Watch this video to learn how to work up to box jumping. You can perform the exercises described above in sequence as a plyometric workout. Go through one set of each exercise, then repeat the whole sequence once or twice more if you like. Remember to start slow as your body becomes accustomed to the demanding nature of plyometric training exercises. If you’re a beginner, or even if you are more experienced but still unsure if plyometrics are right for you or if you are performing the exercises correctly, book an appointment with a personal trainer right away. Your trainer will work with you to design workouts that will accelerate your progress toward your fitness goals. 1. Chu, D.A. (1998). Jumping into Plyometrics. Champaign: Human Kinetics.